Whether your ideal holiday involves an infinite amount of cocktails and parties, or a lot of nature and heritage, Cancun is likely to provide you with what you need. Designed to provide the ultimate tourism experience, the city offers every kind of entertainment right on your doorstep, for an effortless holiday based on relaxation and indulgence. World-class shopping destinations, impressive aquariums and theme parks, exciting watersports and golf courses, or luxurious wellness centres - Cancún has all it takes to tick the boxes of your perfect getaway. 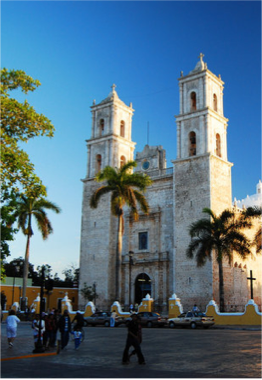 Should you wish to explore, the city is surrounded by breathtaking Maya temples, fascinating cenotes and heritage-filled towns where you can escape from the fast pace of the Zona Hoteliera, as well as getting a more authentic feel of Mexico, its colourful culture and irresistible food! Head to this popular attraction to discover and interact with the various species that compose local marine life. Take a dip with dolphins, mingle with stingrays and turtles, or observe fascinating sea horses, jellyfish, moray eels, clownfish, as well as piranhas, eight foot-long bull sharks and the dangerous tiger shark. If you’re looking for a slightly more peaceful spot, take a four hours drive to the small fishing village of Mahahual which, although rapidly developing, is said to convey the laid-back feeling that busy Playa del Carmen once did. Counting over 150 species of birds, this island is regarded as the Mexican Caribbean’s most important seabirds nesting place. Found 30km North of Isla Mujeres, Isla Contoy is also recognised for its natural beauty. 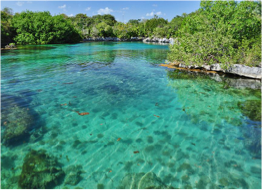 The Cancun area counts a number of eco parks accessible by bus, car, or via organised tours. To make the most of everything they have to offer, visitors are advised to get there as early as possible, as some parks do spread over a rather large surface. Another haven amongst the bustle is Isla Holbox, an island located a three hours’ trip north of Cancun and that is part of the protected area of Yum-Balam. The lagoon that separates the Holbox from the mainland is a sanctuary for tropical birds such as flamingos and pelicans. A 35 km trip South of Cancun is enough to escape the glitzy resorts and shopping centres for a more laidback and authentic feeling. Puerto Morelos is a small fishing village where white sand and turquoise water greet you in an atmosphere where relaxation is all that matters. For a chance to spot and observe local wildlife species in their natural habitat, such as monkeys, flamingos, crocodiles, marine turtles, or even whale sharks, head to one of the abundant reserves located just outside Cancun. Home to El Garrafon, this island is popular for its great beaches and colourful snorkelling, and is only a short boat trip away from Cancun. A two hours trip out of Cancún will take you to this colonial city, a picturesque blend of cobblestone streets, pastel-coloured buildings, and rich heritage that got the town to be named one of Mexico’s Pueblos Magicos (“magical town”). Regarded by many as Mexico’s most spectacular ancient Mayan complex, this World Heritage Site is found 117 miles West of Cancun and is a breathtaking display of the Mayan civilisation’s grandeur through its size, astrological significance, and symmetry.The site is home to the largest Mayan ball court known to date in ancient Mesoamerica, measuring 166 x 68 metres, rising at a height of 12 metres, with walls decorated with intricate carvings and with stone rings still visible on the court. 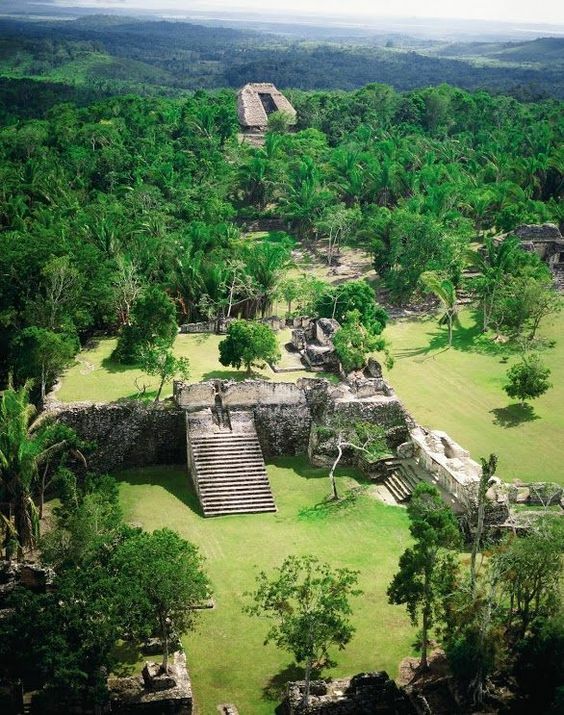 Located 384 km South of Cancun and 64 km West of the town of Chetumal, which marks the border between Mexico and Belize, Kohunlich was built between the Pre-Classic period and the Classic period, resulting in a unique architectural style. 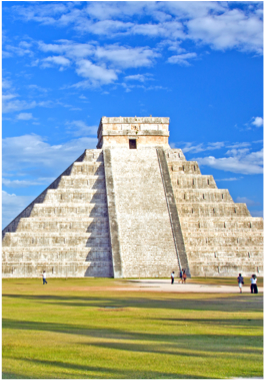 One of the site’s main point of interests is the Templo de las Mascaras, a temple dedicated to the God of Sun. Located 82 miles South of Cancun, the formerly named City of Dawn (Zama), is a unique place combining the mystery of a large ancient Mayan complex, to the breathtaking beauty of the Caribbean coast. Found between two lagoons, in the middle of the thick jungle, this impressive site was once a prestigious city spanning over 75 square metres and counting over 50,000 inhabitants - including several Mayan communities - rivaling in size and importance with Tikal in Guatemala, which it developed strong cultural ties with over the years. Found in Cancun’s hotel zone, between the lagoon and the sea, the remains of this site now home to a colony of iguanas still display the bright colours of its original mural painting. 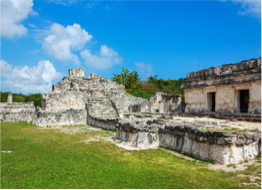 Located 90 miles from Cancun, Ek Balam is Mexico’s latest discovery in terms of ancient Mayan sites, with archaeologists still in the process of unearthing all of its secrets. The site was once used as a residence for governors and priests, protected by three walls on the outside of which the common people would live. 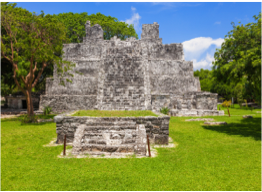 Once a key point in the local commercial route, this site is found 5km away from Cancun and features a pyramid, El Castillo. The remains of this coastal site can be admired in the gardens of the Sheraton Hotel. The TPC club features two 18-hole courses, one designed by Nick Price, and the other designed by world-renowned Tom Fazio.Cancun Country Club will consist of two 18-hole courses – one designed by Tom Fazio, considered to be one of the world’s great golf design architects and one by Nick Price. The Grand Opening will be during Winter 2008/2009. Spreading over 150 acres of lush tropical vegetation, this 18-Hole, Par 72 Championship golf course at Iberostar Golf Club Cancun offers a challenging and enjoyable game at the heart of an ancient Mayan site. Regarded by many as one of the area’s most challenging games, the course winds through a succession of lakes and thick flora, and is famous for having been designed by Robert Von Hagge. Designed by Greg Norman, this was the very first Mexican course to be chosen by the PGA, of which it has been hosting the event since 2007. The course is set in beautiful surroundings featuring spectacular ocean views and landscapes varying from mangrove to thick jungle. Developed with an innovative concept of environmental preservation, this Jack Nicklaus Signature Golf Course is a 27-hole set in a natural backdrop with mangroves and abundant wildlife. Conceived by world-renowned designer P.B. 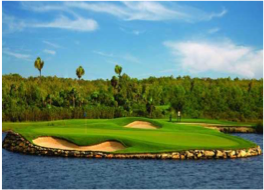 Dye, this course is located a 30 minute-drive from Cancun, and offer a game with world-class conditions and unique challenges. At the Western end of Hewanorra Airport are the Vieux Fort Wetlands, a six acres wide site of pools and wet areas that attracts several species of ducks, herons, sand pipers, plovers, egrets, gallinules, rails and other shorebirds and waterfowl throughout the year. For those who a holiday is not complete without a bit of angling, Cancun is a great place to practice patience and agility with fly-fishing, deep-sea fishing, as well as sportfishing. Located South of Cancun, these locations feature diving and snorkelling sites in shallow waters, often reachable by a 5mn boat ride, and offering great visibility with chances of spotting the likes of turtles, barracudas, nurse sharks, lobsters, and stingrays. Located at the heart of a sandy plain, this site is characterised by its slopes and pelagic species, as well as its sponges, coral and macro invertebrates. Expect current and depths of up to 40 metres. 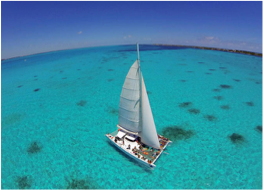 To explore Cancun from a different angle, hop on one of the many organised sailing tours, or rent your own boat for a tailored expedition of the beautiful coastline. And if you wish to mix sailing with partying, get a place on one of the booze cruises organised by some operators. A popular offshore spot providing great snorkelling and diving with great visibility and an average depth of 10 meters. The site also features an art installation belonging to the Museo Subacuàtico de Arte (underwater museum), and representing a young girl lying in a coral garden, around which marine life such as lobsters, rays, sergeant majors, and groupers peacefully glide. Located at the eastern end of the Zona Hoteliera, Punta Cancun is a popular site that provides access to several other diving spots. Healthy and colourful coral with marine life such as rays, barracudas, and sharks. 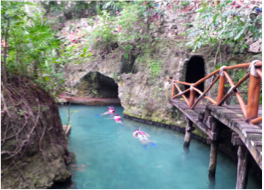 A diver’s visit to Canún would not be complete without a dive in one of the area’s famous cenotes, natural sinkholes filled with fresh water that are the result of collapsing limestone caverns. Interlinked by underground tunnels, cenotes offer an exciting and one-of-a-kind diving experience at the heart of an intricate cave system, filled with crystalline waters and boasting million-years old limestone formations.